Financial Accounting - Enterprise Edition software manages business accounting information at single place with barcode support. Billing management utility helps to analyze sales/purchase records, profit and loss information, tax details and other similar accounting data. Accounting software generate various reports including balanced sheet report, trial report, profit and loss report, account report and other similar reports for total calculation of business accounts. Advance billing and accounting software manages business records including customer records, company details, voucher entry and other information. User can easily maintain accounting records as compare to manual accounting in single computer system and provides more efficiency for both small and medium size enterprises and organizations. 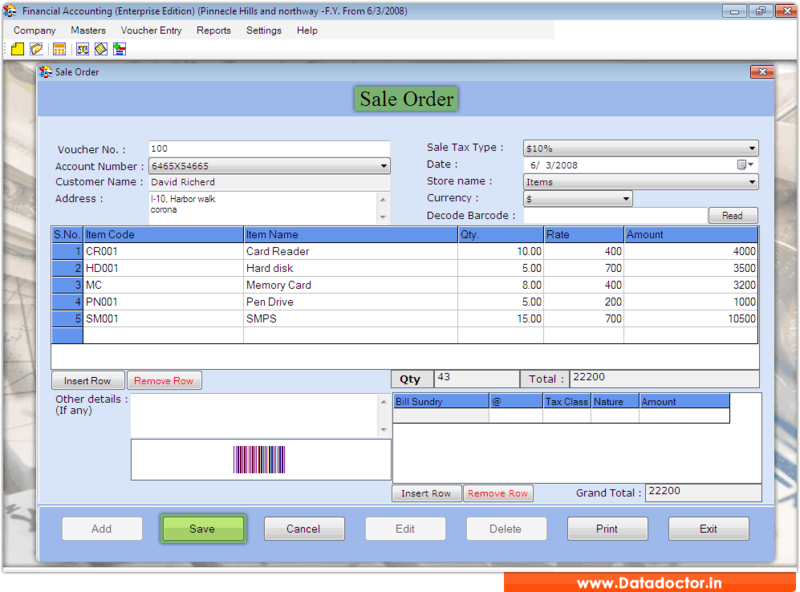 » Barcode ready financial accounting software is helpful to manage business accounting records with barcode setting. » Generates various reports for total calculation of business accounting transaction and saves time taken in manual searching of financial records. » Provides user and administrator setting and freeze date options to prevent unauthorized user access from any change or modification of software setting. » Provides data connectivity feature that is useful to fetch the data from parallel computer machine within the network. » Facilitates shortcut icon option to directly create and access multiple company accounting records. » Reduces duplicate records and provides backup and restore facility for future use.